As part of the UNE Discovery Voyager school program we have a wonderful opportunity to visit and observe the natural world in many different locations throughout northern NSW. Collection and observation of soil samples at these schools during the SCIENCE OF SOILS sessions has enabled us to investigate the physical properties, pH, microbiology and biodegradation processes of many different soils and sites. One of our most exciting discoveries was to find a rarely seen species of fungi hidden in a shaded garden bed mulched with pine bark chips at a school in Armidale. Lying under the decaying leaf litter and bark the students found what looked like a number of puffballs – white circular fungal bodies which contain spores, about 4-6 cm in diameter. There also seemed to be some white netting in the vicinity which we assumed was discarded plastic garden refuse. We collected the specimens and took them back to our Soil Microbiology table to look at them more closely. Imagine our amazement when the outer coating of the “puffball” was cut to reveal what resembled a white brain cerebellum inside, covered by a pale yellowish gelatinous substance! When we pulled out the inner part it came out perfectly as an intact meshed cage suggestive of the panels on a soccer ball. None of us had seen anything like it before. 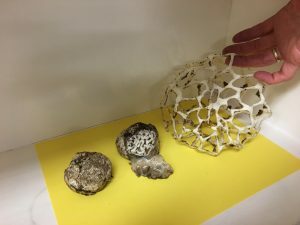 Later we identified the fungi as the Lattice or Basket Stinkhorn, Illeodictyon gracile (Smooth Cage) which is made up of a mesh of polygons and commonly described as resembling a hollow soccer ball. The mesh arms can be broad, white, and transversely-wrinkled but do not widen where they join (Ileodictyon cibarium); or thin, smooth, white and thicker at the junctions (Ileodictyon gracile). The slimy, brown, smelly spore mass called the gleba coats the inside. When ripe the cage springs from the egg often rolling along the ground to release the spores. Stinkhorn mushrooms (the Phallaceae family of fungi) are rather interesting and diverse in body structure (check out images of other genera at the links below) but all begin their development as an oval or round egg structure. The BBC Planet Earth series films the emergence from the forest floor of another stinkhorn species with its white netted skirt in the Jungles episode. Ileodictyon gracile is reported to be native to Australia, New Zealand, and Chile, and has been introduced in East Africa and Europe. Our Facebook post about this discovery generated a lot of interest and was one way in which we were able to communicate more details about this remarkable find back to the school. Who knows what else we might find when we dig beneath the surface of soils at other schools.